High atop the roofs of Manhattan, Mike, Don, Leo and Mondo are discussing the strange meteors they saw hovering near a building a few blocks away. April and Splinter then arrive (Raph is apparently detained, both sulking and sewing) and April happily reveals that Splinter is teaching her how to use a katana. April proceeds to explain that she and Splinter had been researching the logo on the side of the building; a logo she had recognized at enemy camps throughout their South American adventure. Apparently, the building is part of a corporate conglomerate owned by a man named Null. At Null’s headquarters, he’s having an argument with Skul and Bean. Null wants his lawyers to draw up a contract, outlining his new alliance with the Children of Maligna. Skul and Bean would just as soon keep lawyers out of the equation. In a manner of exposition found only in comic books and cartoons, Skul and Bean then detail how they followed Cudley the Cowlick back from Hirobyl in their spaceship (which was disguised as a meteor) and then managed to enter Earth’s atmosphere by passing through a hole in the ozone layer. Skul and Bean eventually wear Null down and he concedes to dismissing his lawyers. Skul and Bean agree to give Null the means to take his operation off-planet, so long as he uses his resources to help Queen Maligna conquer Earth. Kid Terra overhears the entire conversation and quietly creeps out of the office. South of the border, Man Ray is being lead by a school of dolphins toward the strange meteorites he’d left to go investigate last issue. He finds them arranged in a deliberate pattern on the sea floor. Before he can investigate further, one of the meteorites begins to move on its own power, blindsiding Man Ray and carrying him out of the water and off into the distance. On a beach, Dreadmon and Jagwar are chilling out and admiring more “shooting stars” when the meteorite carrying Man Ray crashes in front of them. They help Man Ray to his feet and introduce themselves (Jagwar enjoys Man Ray’s fishy odor, while Man Ray is not amused). The pleasantries are cut short, though, as the meteorite begins to ominously crack open. Back in New York, The Turtles and their cohorts are considering breaking into Null’s building, though the legal ramifications of breaking and entering concerns them. Their scheming is interrupted when Kid Terra arrives (how’d he know where they were?) and holds them up with his guns. The Turtles and April still hold a serious level of resentment toward Kid Terra ever since he killed Bubbla, but Kid could care less. Kid begins to warn them of Null’s scheme when Raph finally arrives and lays him out with a ninja-kick upside the head. The Turtles begin to wonder what Terra was talking about, when Skul and Bean attack! The fight is fairly one-sided, as the aliens are impervious to all of the TMNT’s attacks. Annoyed, Skul asks Bean to “drop a load”. Bean fires a glob of weird good out of the hole in his noggin, which proceeds to explode, knocking all the good guys out cold. The mysterious Null then arrives on the scene, at last revealing his visage: that of a horned devil. 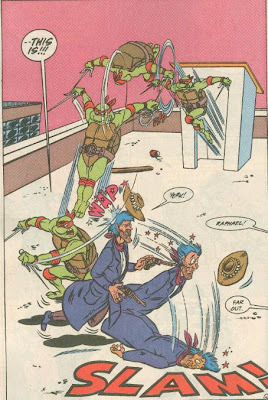 *This story is continued from TMNT Adventures #18. 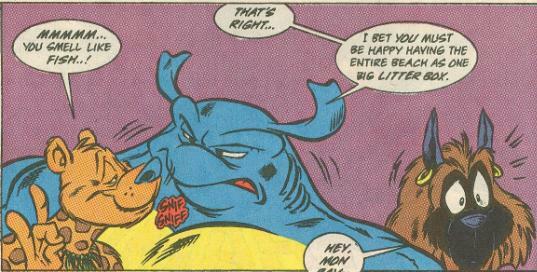 This story continues in Mighty Mutanimals (miniseries) #1. *Bean, Skul, Null and Kid Terra were last seen in TMNT Adventures #17. *Kid Terra killed Bubbla and Dreadmon and Jagwar were last seen in TMNT Adventures #16. *Cudley the Cowlick was last seen in TMNT Adventures #14. *This issue was reprinted in the UK by Fleetway in TMHT Adventures #33. With the South American tour arc behind us, the next story arc is free to begin: the battle against Queen Maligna and the birth of the Mighty Mutanimals! What’s wonderful about this arc is that it’s built upon just about everything that’s come before it. 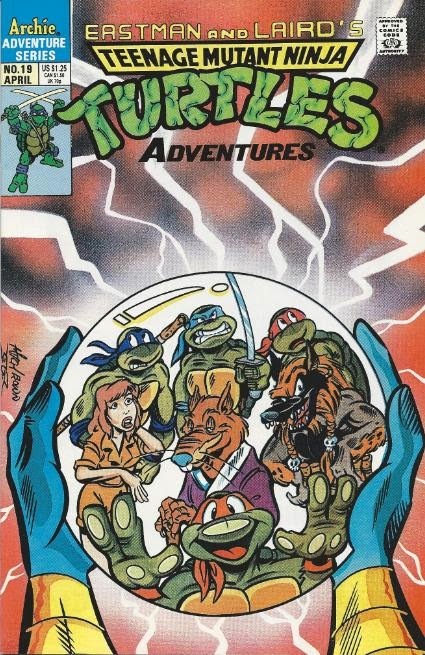 Maligna’s invasion was foreshadowed as far back as TMNT Adventures #12 with the various members of the Mutanimals being introduced both before and after that. The entire South American tour arc, dreadful though it may have been, served primarily as build-up toward this storyline, almost making the whole thing worthwhile (almost). This story arc is the result of quite a bit of build-up, so if you’ve been reading the series from the start, it really does feel pretty epic. Clarrain (Murphy) continues his crusade against Corporate America with the reveal that Null, a corporate businessman, is in fact the devil (or a devil, anyway). I’d say that the subtext is more than a little blunt, but considering the public service announcement that was the past five issues, it’s pretty subtle for Clarrain. 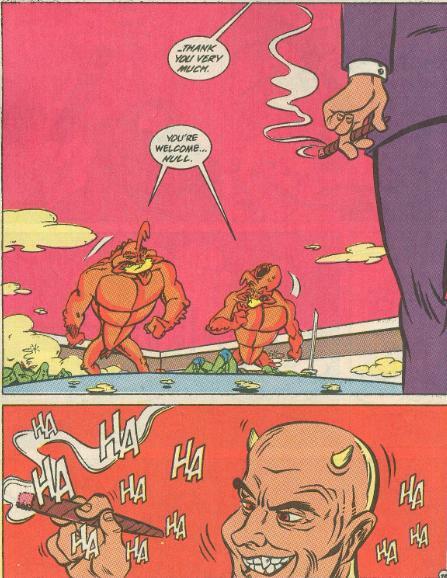 Making corporate executives evil villainous masterminds was all the rage in the late 80s and early 90s. I mean, just take a gander at John Byrne’s revamp of Superman’s arch-nemesis, Lex Luthor, which had occurred only a few years back in the Man of Steel’s own book. While the trend has become just another comic book cliché these days, it wasn’t quite so common place back in ’91. Kid Terra’s evolution as a character is an interesting one. You have a hard time liking the guy, considering he killed Man Ray’s little buddy, Bubbla (even if it wasn’t entirely intentional—but he was still trying to shoot Man Ray), and the fact that he condoned and aided in so much of Null’s other evil deeds, such as slaving and dumping. However, his attempts toward redemption are sincere, making him a villain that challenges both the characters’ and the readers’ sense of forgiveness. Garrett Ho isn’t my favorite artist for the book, with his Turtles looking fairly malformed, and not in an endearing kind of cartoonish way, either. I’ve never had a problem with how he draws any of the other characters, particularly the other mutants like Mondo or Jagwar, but there’s something about the way he draws the Turtles’ faces that just doesn’t sit right with me. This issue is really just the set-up, all things considered. The real action will get underway very soon. Haha, confirmation in Turtle Tracks that Stump and Sling are parodies of "Donald you-know-who" and "another famous Donald." Credit to Tetsu Deinonychus over at the Technodrome Forums for the find.